Australian cities are changing. Instead of families living in low-density suburban areas, more parents are raising children in high-rise housing in inner-city areas. Despite this, much of the high-rise housing stock in Australia has been developed for residents without children. Our recent study, published in the journal Cities & Health, explored parents’ experiences of raising preschool-aged children in high-rise apartments. We found while parents appreciated that apartments offered affordable housing close to employment, they found the design challenging for raising children. Considering the growing number of families raising children in inner-city apartments, city planners must start designing for more child-friendly living. This includes providing communal spaces where children can play, adequate laundry facilities and ensuring design features are safe for children. Apartment living for families with children is a relatively new phenomenon in Australia, but it’s growing. According to 2016 Census data, the number of families with children living in apartments increased by 56% between 2011 and 2016. And nearly half of all apartment dwellers on census night in 2016 were families with children. But this type of housing may not be meeting the needs of Australian families. A 2015 household survey in the City of Yarra (an inner-Melbourne municipality where apartments now make up 46% of the housing stock), found residents in high-density areas were less satisfied with their neighbourhood as a place to raise children than those in lower-density areas. Read more: What's equity got to do with health in a higher-density city? Our research used a method called Photovoice to help understand why parents in private, high-rise dwellings in Yarra felt this way. Over a three-week period, parents photographed aspects of apartment living they considered beneficial and challenging for raising preschool-aged children. We then interviewed them individually and as a group. Parents accepted some of the challenges in return for having easy access to employment, which they said allowed them to spend more time with their children. They were also accepting of having only a small amount of private outdoor space or none. But many were concerned that the communal outdoor space in their apartment complex was either absent or inappropriate. This reduced the opportunity to spend time outdoors with their children. One parent captured this in the below photograph. There’s no softness in the space, there’s no child-friendly area… I can’t just hang out in my complex, I have to leave if I want to give him some outside time… so I find that really challenging ’cos I just want to be able to go outside with a cup of tea and put him down so he can crawl around. The close proximity of apartments was problematic too. One parent described it as “like living in Big Brother house”. This had the effect of some families keeping their blinds down all day. Parents were also concerned about opening windows at night because noise from other residents would wake their children. Conversely, trying to keep family noise to a minimum so as not to disturb neighbours was a constant battle. … our bedroom window … opens to someone’s balcony underneath us… the monkey’s lying at floor level, the window opens from the floor up … there is a lock on the window which does restrict it to just being open about 10 centimetres but … the layout to the apartment is incredibly narrow … it gets really hot and stuffy and then if we undo the lock to let any air in, it’s a hazard. A range of housing issues have been associated with poor health and development outcomes for children. These include overcrowding, insecure tenancy, air quality, exposure to pollutants, hazards and noise. Yet specific research on the impacts of high-rise living on children is sparse. There are some reviews that highlight negative impacts on children’s psychological health and development. But many such studies have focused on disadvantaged children in high-rise housing, so it’s difficult to isolate the physical aspects of dwellings from other socioeconomic influences. Evidence of some negative aspects of apartment living in Australia is emerging though. Research in Sydney showed an increase in children presenting at The Children’s Hospital at Westmead with serious injuries due to falling from apartment windows and balconies. Another study showed parents’ management of children’s noise in high-rise apartments in Sydney affected the way parents allowed their children to sleep and play. Parents reported closing windows and not having friends visit. Similarly, a Melbourne study showed that primary-school-aged children felt discouraged from everyday play in so-called “communal areas” in private high-rise apartment complexes due to neighbour complaints. A recent report by the City of Melbourne states that one in three apartments in Melbourne built prior to new guidelines being implemented were considered to be of poor quality in relation to criteria including size, privacy, ventilation and communal space. New apartment design guidelines in Victoria, which include requirements for building arrangements and amenity, are a start to addressing some of the generic issues raised by families in our study. But these can’t resolve problems in apartments designed before the guidelines were implemented. And given the high proportion of children living in high-rise apartments in Australia, it is disappointing that the Victorian guidelines mention them only once. It may be time to consider more explicit child-friendly guidelines for high-rise living. Overseas examples could be drawn on, such as those developed in several Canadian cities. These include objectives such as designing the environment with the safety needs of children in mind and providing children of all ages with easy access to appropriately located, designed and landscaped outdoor play areas. The study was carried out in conjunction with Dr Elyse Warner from the School of Health & Social Development, Deakin University, and Dr Belinda Robson from the City of Yarra. Hai! Assalamualaikum semua pengunjung setia Blog naif Ayujue. Semoga sentiasa sihat, ceria selalu dan wajah cantik berseri. Siapa kat sini tak suka CANTIK sila angkat tangan! Siapa angkat, dia tipuuuuu! Dah jadi lumrah manusia sukakan kecantikan. Kalau pun kita tak suka cantik, kena juga jaga untuk yang tersayang. Ye dop? 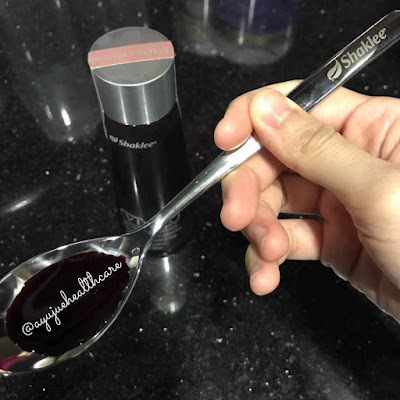 Bila bercakap tentang wajah cantik berseri ni, mesti ramai yang berangan angan nak KULIT SIHAT, TANPA JERAWAT, BEBAS JERAGAT, FLAWLESS, TAK KUSAM, dan CERAH SEKATA. Terutamanya untuk mommy mommy yang sentiasa ingin cantik, vourge dan anggun walaupun terpaksa bawa 'handbag' kemana mana. Walaupun dah beranak pinak tapi kecantikan luar dan dalam mesti kena jaga. Bukan untuk siapa pon. Untuk suami kita juga kan? Betul tak? Kalau selekeh jer dan tidak pandai menjaga kecantikan suami pun segan dan mulalah mencari alasan untuk pasang spare part. Oh lelaki! 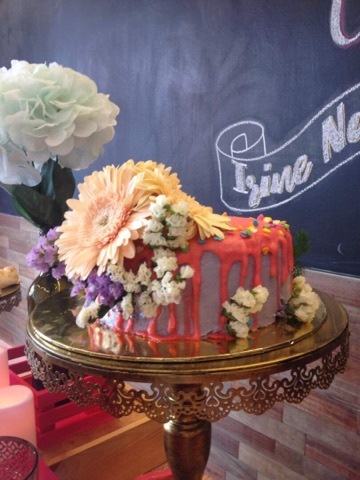 Cantik tak Jue? Okay Bye! Ni confrim bukan Jue..
Untuk kecantikan dalaman dan luaran, Jue amalkan pengambilan Suplement. Antara supplement yang Jue memang tak boleh nak tinggal ialah Supplement KECANTIKAN KULIT SHAKLEE. Selain daripada pemilihan Skincare yang betul, penjagaan dari dalam sangatlah penting untuk memastikan kulit kita cukup nutrien. Meh kita tengok apa yang ada dlm set kecantikan kulit Shaklee??? Jue terangkan satu satu ye..
Bagi you alls yang baru nak berkenalan dengan supplement, make sure you dapat consultation yang betul tentang pengambilan supplement tau. 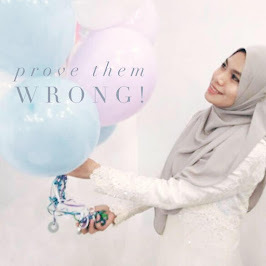 Kalau tak, jangan salahkan produk if you tak dapat hasil yang you idamkan ok.
Bagi yang nak consultation percuma dari Jue, boleh direct PM Jue di 0197671102. Siapa yang follow FB Jue, haritu Jue ada janji nak share tentang perjalanan hiking Jue dan kawan kawan ke TASIK BIRU yang superb cantik tu. Disebabkan 2 orang dari geng lab Jue akan mula bertugas untuk kerjaya masing masing, we alls mula search aktiviti yang tak memerlukan budget yang tinggi. Maklumlah, Student! Tapi, cipta memori bersama tu penting orang kata. Barulah ada rasa rindu bila berjauhan. giteww! 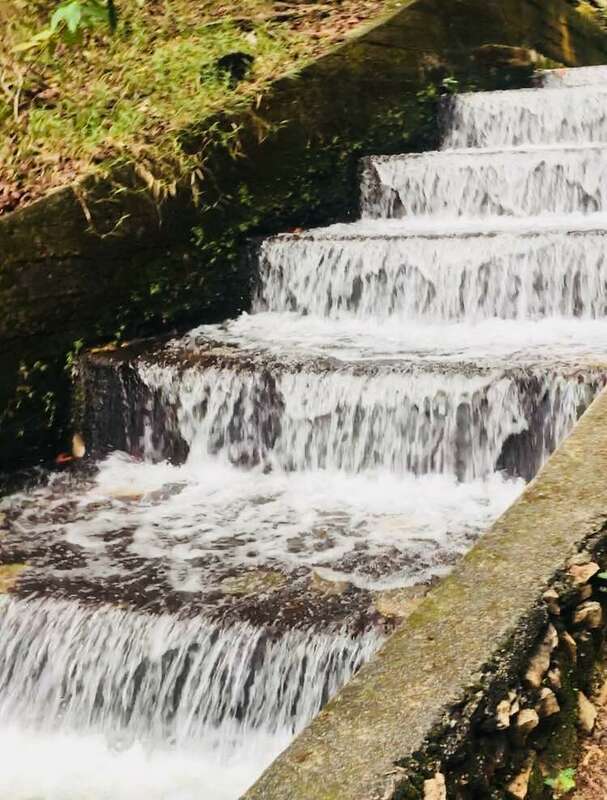 Tasik Biru ni terletak di Bandar Baru Kangkar Pulai. Dekat je dengan UTM, SKUDAI ni, tapi apakan daya, dah 10 tahun menetap di UTM ni, penutup tahun 2017 baru tahu ada tempat best macam ni. Kesian. Nak masuk ke kawasan ni, takde "signboard cekelat" macam pusat rekreasi yang kita biasa pergi tau. Sebab kawasan ni actually kawasan perlombongan. 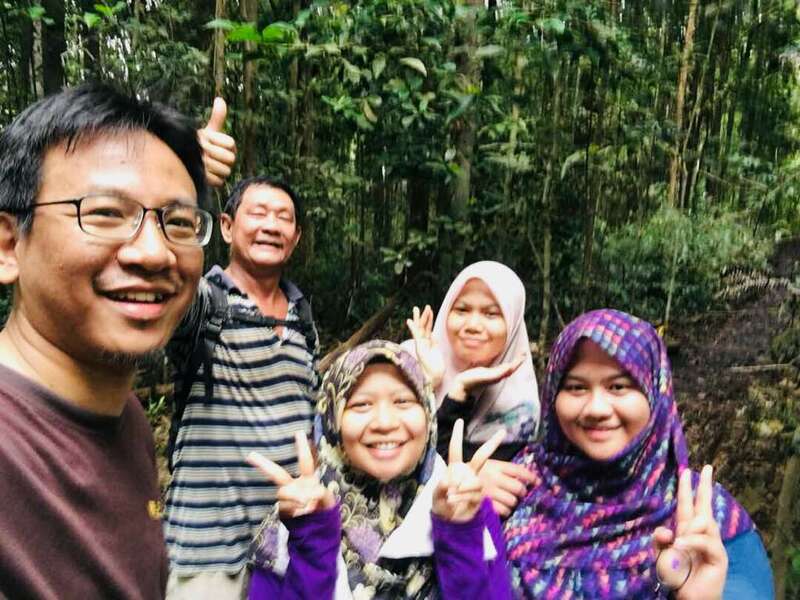 Kalau selepas masuk kawasan perumahan, you alls kena lalu kawasan jalan berbatu tu, you're in a right track la tuu. Terus je masuk sampai you alls jumpa kawasan lapang untuk parking. Dari sini lah bermulanya pengembaraan you alls. Bermula dengan laluan selepas palang besi, ada jalan ladang kelapa sawit. 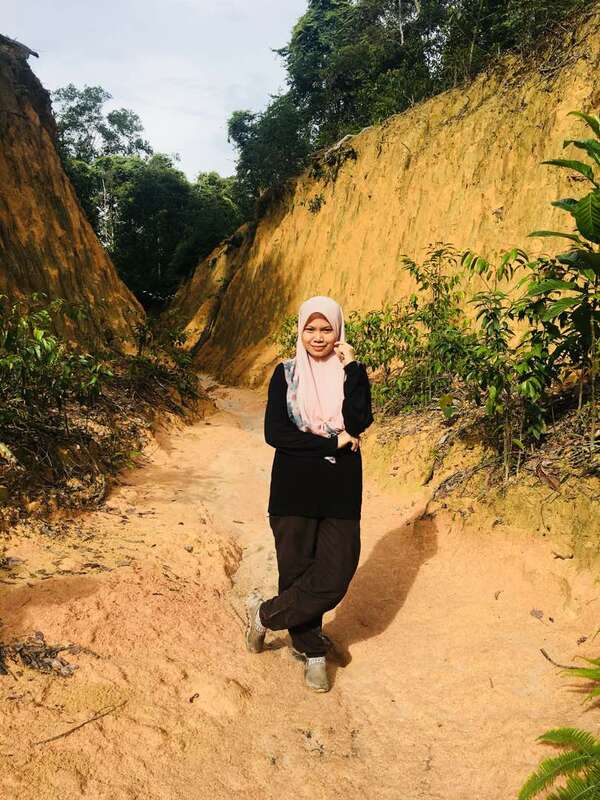 Kat sini you alls boleh la baling dadu nak ke kanan atau ke kiri. Kalau salah jalan, padan muka! haha. Okay, Jue taklah kejam sangat. Actually, both jalan you alls boleh guna. Masa first time Jue pergi, we alls just ikut instinct je. Instinct tak berapa baik, we alls pilih kanan, lebih afdhal. Rupanya lalu jalan yang agak mencabar. 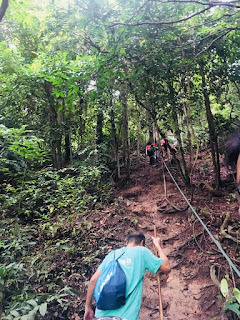 Berjalan kaki sejauh 1km melalui ladang kelapa sawit dan dalam 50 meter mendaki akan sampai dipuncak. Di punya mendaki mencabar babe! Tapi setiap kawasan yang agak bahaya, dah tersedia dengan tali. So, jangan risau! Ini view yang you alls akan dapat dari puncak. Bila dah sampai kat sini, baru tahu yang kalau pilih kanan tadi, akan sampai juga kesini tapi melalui jalan yang lebih landai. Hoho! 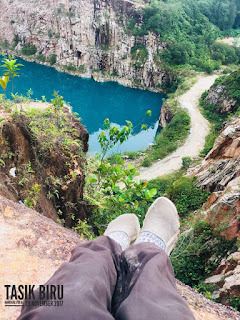 Kat atas puncak bukit ada 2 laluan, ke kanan menuruni bukit akan sampai ke kaki Tasik Biru. 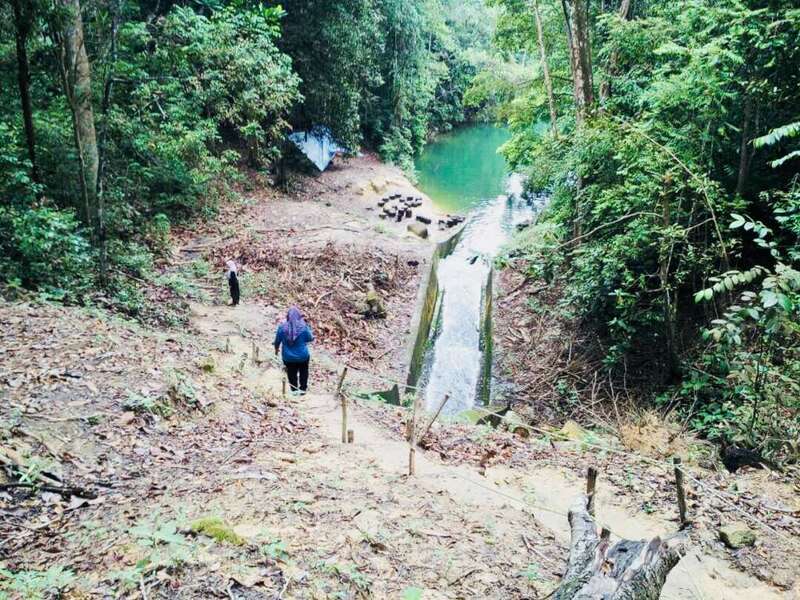 Manakala sebelah kanan ada lalulan jalan kebun dan berbukit denai sejauh 7 km menyusuri lereng bukit untuk sampai kembali ke Tasik Biru. you alls ada pilihan untuk terus menikmati kecantikan Tasik Biru atau meneruskan perjalanan untuk explore lebih lagi. "kamu baru berjalan 1/3 perjalanan untuk sampai ke destinasi"
Seriuslahh unclee! We alls macam nak tercabut urat kaki dah nii.. huwaaa! 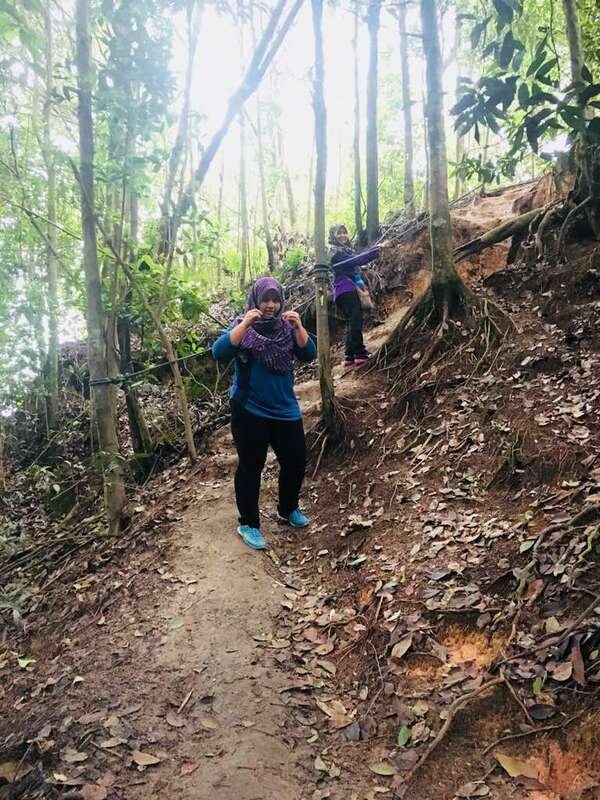 Selepas meneruskan perjalanan melalui trek dalam 5 km, you alls akan jumpa 2 empangan, Laluan kiri masuk menuruni bukit akan sampai ke lurah Tasik biru. Wahhh!! Kat sini you alls mesti tak sangka wujudnya banyakk ikan dalam tasik ni. Pantang di campak roti, pasti ikan akan datang mengerumun dengan rakus. 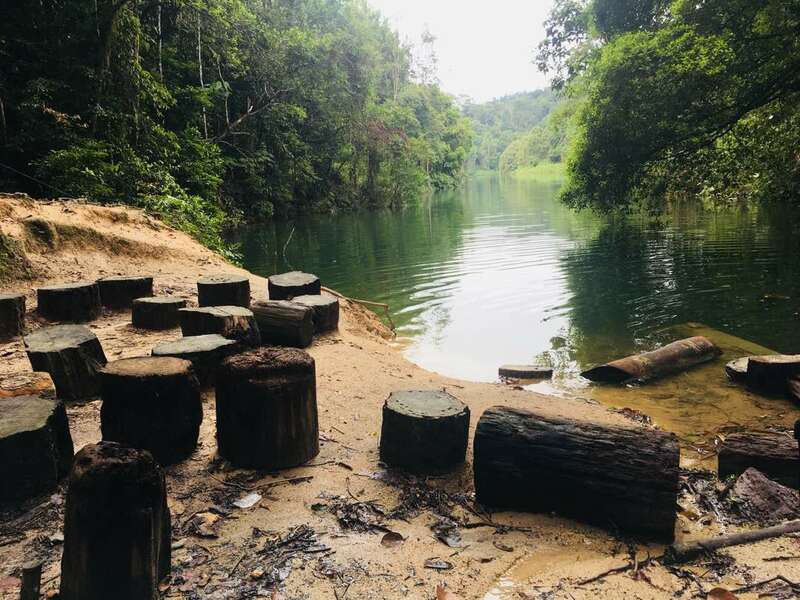 Selepas naik semula dari lurah tasik, You alls akan menyusuri tepi tasik untuk sampai ke empangan ke 2. Di empangan kedua ni pun you alls boleh je bagi makan ikan. Merasa lah ikan ikan tu makan karipap 3 singgit makcik jual tepi jalan Pulai tu. Memang banyakkk sangatt ikan kat sini! Rasa nak tangkap buat spa ikan kat bilik. Lol! Dari empangan ke 2, you alls perlu mendaki bukit, semak dan berteping tinggi baru la akan jumpa semula dengan Tasik Biru. Tadaa! Meh Jue Share antara view yang menarik di sini. Last sekali, lepas you alls jumpa jurang macam gambar kat bawah ni, you all akan jumpa semula jalan pertama dan keluar dari Tasik Biru. TAPI.. Macam mana kita happy pun nak menikmati keindahan Tasik Biru ni, you should know, ada bahaya nya. 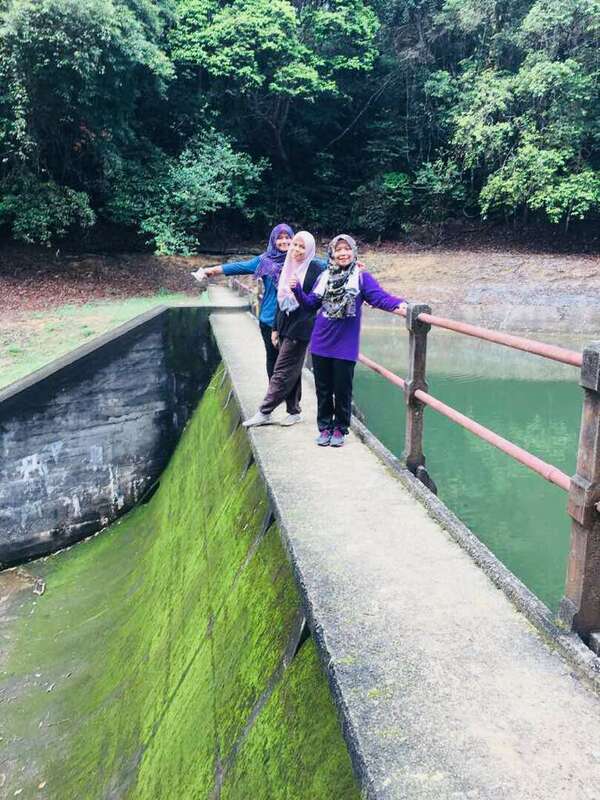 Now, let me tell you info about Tasik Biru. 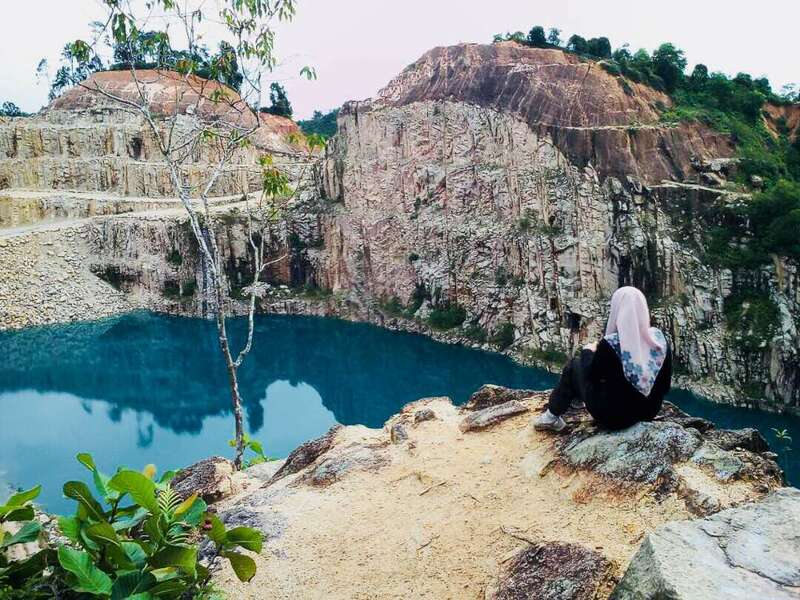 Macam mana boleh terbentuknya tasik yang cantik dengan air yang biru ni? 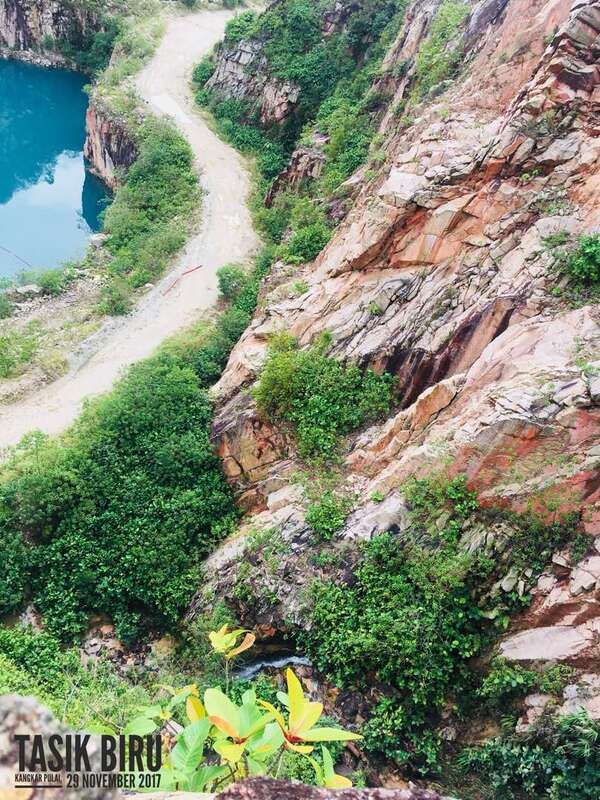 Tasik Biru ni bukanlah tasik semulajadi, ianya terbentuk oleh lombong Kuari yang ditinggalkan begitu sahaja. Walaupun memang ada perancangan selepas itu, proses membangunkan kawasan bekas lombong memakan masa. 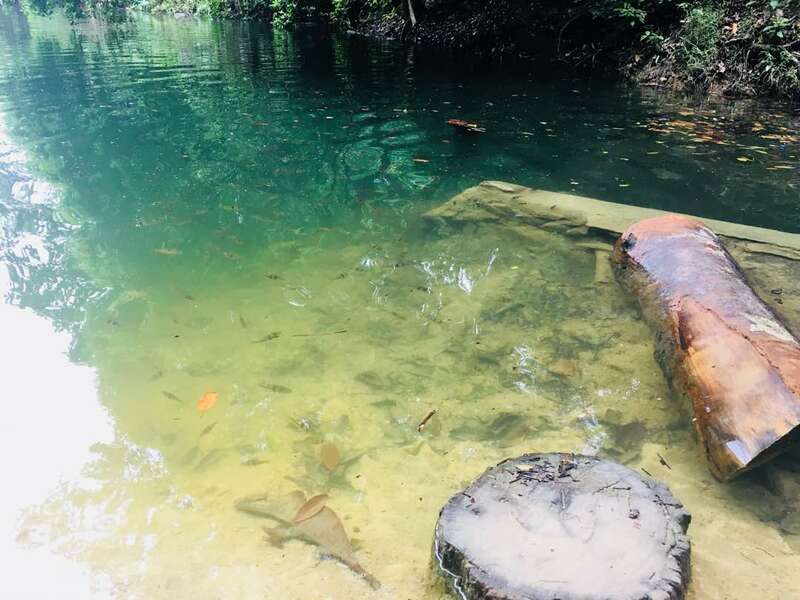 Terdapat banyak kawasan bekas lombong yang telah di bangunkan dan kini menjadi pusat tumpuan perlancongan dan rekreasi seperti Sunway Lagoon, The Mines, Taman Ampang Hilir. 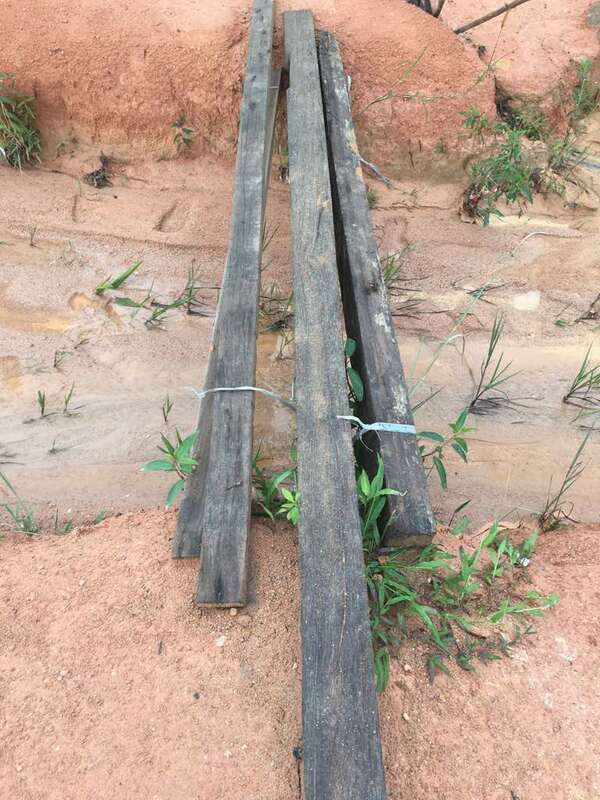 Kuari ialah kegiatan atau lokasi perlombongan terbuka bagi mendapatkan batu atau galian dan biasanya dijalankan di kawasan berbukit. Di Malaysia, lesen syarikat kuari di keluarkan oleh kerajaan negeri kerana pentadbiran tanah terletak di bawah kuasa kerajaan negeri. Bongkah bongkah batu yang diletupkan akan runtuh dan jatuh, seterusnya di hantar ke mesin pemecah batu supaya ia lebih kecil dan halus. Hasil perlombongan dan letupan bukit mengakibatkan jurang dan lubang yang dalam. Ini menyebabkan air bertakung. Kesan warna biru kehijauan adalah pantulan warna langit dan bayangan pokok. 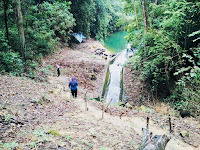 Air tasik kuari sangat jernih di sebabkan tindak balas kimia batuan dan tanah kuari serta tiada lagi aktiviti manusia di kawasan berhampiran kerana biasanya kuari ini telah pun di tinggalkan. Tasik kuari kemungkinan mempunyai kedalaman 2 hingga 20 meter dari permukaan dalam bergantung pada hujan dan jenis lombong. Air di kuari juga terbentuk dari air mata air atau akuifer. 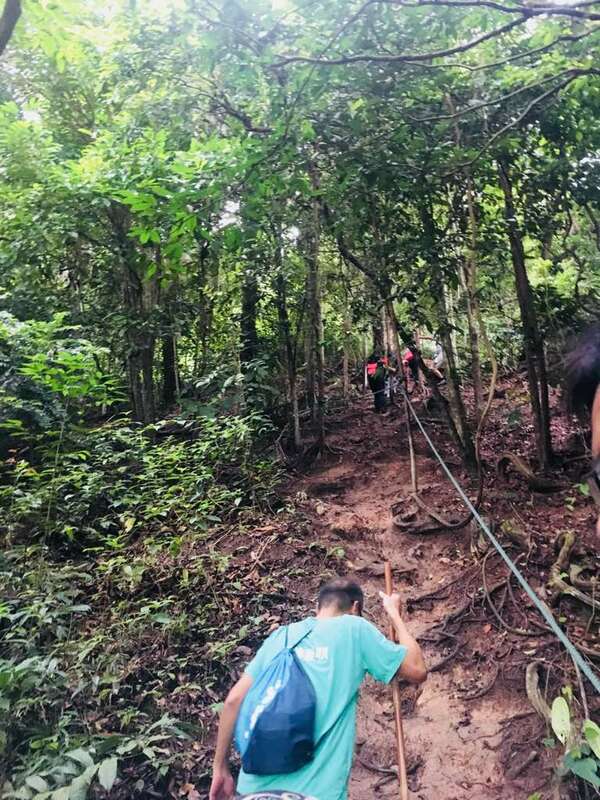 Bahayanya di kawasan ini ialah tebing bukit yang tinggi dan berbatu boleh menyebabkan tergelincir dan air yang dalam. 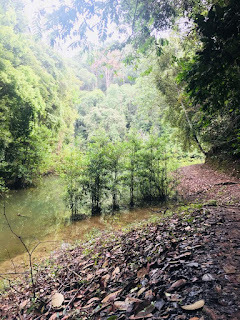 Banyak kes lemas di tasik akuari telah di rekodkan. Hati hati ya! Berdasarkan kajian, aktiviti perlombongan yang telah dijalankan pada masa lalu telah meninggalkan jumlah pepejal terlarut dan logam berat. Di sebabkan itu, anda tidak digalakkan untuk mandi. Pilih KASUT yang betul. Ada trek yang agak licin terutama pada waktu pagi and kalau incase hujan. Jangan lupa bawa AIR MASAK. Kalau you alls ikut trek jauh, Air tasik tu pun you akan rasa nak sedut je guna straw! Semoga perkongsian ni dapat membantu you alls semua. Throwback sekitar event Pearls November yang lalu. Selain daripada event event yang di anjurkan oleh SHAKLEE MALAYSIA, team Jue juga aktif dengan aktiviti aktiviti yang di anjurkan oleh upline upline. Untung dapat upline yang sangat prihatin. bukan saja kita dapat reward if kita berjaya capai target atau task, tapi dapat jumpa face to face untuk eratkan ukhwah. Ini ialah sebahagian daripada ahli Pearls yang datang memeriahkan Gathering Event yang berlangsung di Disenar Space, Kuala Lumpur. kalau nak di ikutkan, ahli Pearls memang sangat ramai. Tapi disebabkan tak semua available masa tu, ini sahaja lah yang ada. InshaaAllah gathering seperti ini bakal jadi event tahunan untuk Pearls and Jue berharap one day team Jue sendiri Stupendous Gems akan sekukuh team Pearls. Actually, event macam ni sangatlah membantu untuk naikkan semangat untuk lebih serius dalan bidang bisnes. masa niii lah masing masing berkongsi tips untuk berjaya dan mereka mereka yang hebat ni langsung tak lokek nak sharing. Bila dah jumpa, masing masing berebut nak sedut aura positif which is sangattt penting untuk kita terus berdiri teguh sebagai Penjual Supplement yang hebat! Sekalung tahniah buat Master Irine Nadia &Master Amirul atas kejayaan mereka mencapai rank tertinggi dalam Bisnes Shaklee. Doakan Jue dapat panjat tangga Rank Shaklee dengan cemerlang. 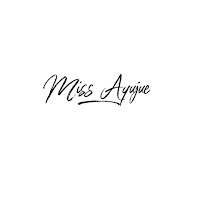 MASTER AYUJUE one day, In syaa Allah. Wanna be a part of our team? "Kak, kita pregnant", kata seorang adik di awal pagi sambil drive kereta. Tak mampu nak suarakan rasa hati bila mendengar berita gembira itu. Kalau lah awak tahu betapa akak menunggu berita baik ni dik. Apatah lagi awak kan..
Adik ni disahkan ada cyst di ovari kanan pada Januari 2016 dan doktor hospital terus buat laparoscopic cystectomy (pembedahan tebuk 3 atau 4 lubang dan guna camera). Diagnose chocolate cyst 5x4cm di ovari kanan dengan endometriosis (sel rahim yg tumbuh luar rahim) stage 2. Bulan Julai 2016 disahkan lagi recurrent cyst di tempat yang sama (ovari kanan) dgn kebesaran 5x5cm. Pada April 2017, adik ni sekali lagi menjalani Laparascopic Cystectomy untuk buang cyst beserta procedure dye test utk cek keadaan tiub fallopio. Hasil diagnose, terdapat chocolate cyst bersaiz 5x5cm dan result dye test menyatakan bahawa tiub fallopio sebelah kanan tersumbat dan bengkak manakala tiub sebelah kiri mempunyai aliran cecair yg minimal (hampir tersumbat). 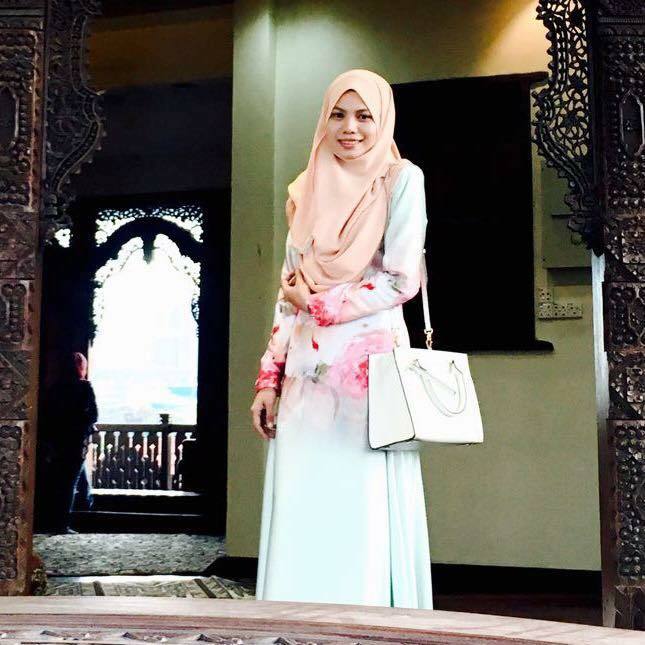 Dan disahkan endometriosis stage 3 sebab banyak lekatan di sekitar luar rahim dan belakang rahim. Start May 2017, adik ni cuba untuk ikhtiar dengan supplement Shaklee. 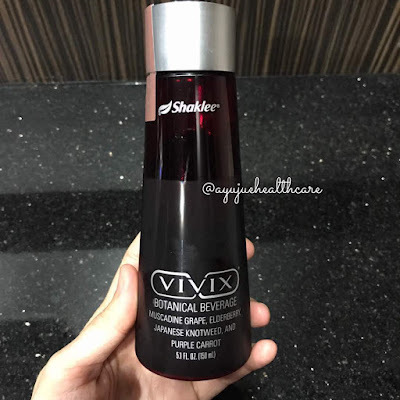 Beliau start amek vivix dan vitamin C secara konsisten. Oktober 2017, appointment last dgn doktor. Rahim okay dan tiada cyst recurrent lagi. Doktor kata chances utk hamil secara normal sangat tipis memandangkan tiub kanan sumbat dan kiri hampir nak sumbat. Doktor sarankan buat IVF terus sebab kaedah lain untuk conceive tak efisien untuk keadaan macam adik ni. Doktor stopkan appointment di hospital untuk dirujuk ke hospital yang ada pakar kesuburan bagi rujukan untuk procedure IVF. Tapi adik ni still consistent ambil 2 supplement tu. November 2017, plan untuk register IVF bulan Januari 2018. Dalam masa yang sama, dah lewat datang period around 3-4 hari. Adik ni terasa nak cek UPT tapi tak expect apa apa disebabkan beliau tahu condition badan beliau sendiri. End up, naik 2 line dekat upt test. Bila cek dekat klinik rupanya dah 5 minggu. Alhamdulillah. Ya Allah..Jom kita doakan adik ni dan kandungannya diberikan kesihatan dan dipermudahkan dalam proses melahirkan. Next post nanti Jue kongsikan antara amalan yang dilakukan selain daripada pengambilan secara konsisten. Harap kisah beliau boleh tolong orang lain yang sedang berusaha untuk hamil. **share jika bermanfaat untuk mereka yang memerlukan. Tengah buntu nak sarapan apa ke tu? Harini Jue nak share resepi untuk menghilangkan kebuntuan korang. ESP + PISANG + PEANUT BUTTER. 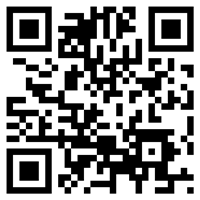 Cara buat boleh refer video and gambar. Tak susah pun korang nak dapat sarapan yang berkhasiat and kenyang lebih lama. Tambahan pula, pisang boleh bantu korang untuk detox secara semulajadi. Bila dah detox, barulah badan rasa ringan jee. Ye dok. Bagi korang yang tak boleh nak telan rasa asli soya tu, JANGAN TAKUT. Kita boleh PELBAGAIKAN RASA ESP ikut citarasa kita! Harini Jue tunjuk cara bancuh ESP dengan EPAL HIJAU. Korang boleh je gantikan buah epal dengan buah buah lain. Tapi untuk Jue, Jue prefer rasa masam masam sikit. Kalau hari-hari minum yang sama je bosan jugak. Sesekali boleh pelbagaikan dengan resipi lain. Resipi and cara membuat boleh refer gambar and video okayyy? Instead of kenyang lebih lama, epal hijau sangat rendah kalori. Sesuai sangattt la dengan korang yang nak diet. PROMO ESP BULAN NI MASIH BERJALAN! Nak selit order? Meh rojer rojerrr!